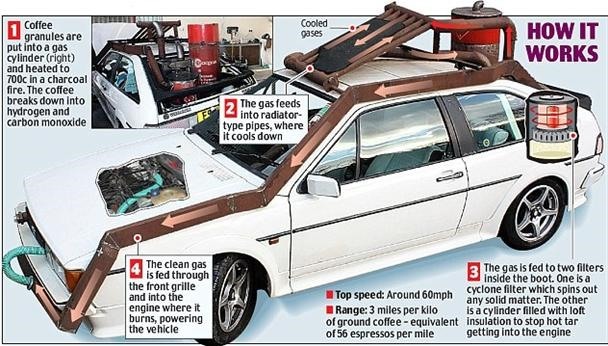 "The car will be driven the 210 miles between Manchester and London powered only by roasted coffee granules. It will go on display at the Big Bang science fair in Manchester to show how fuels other than conventional petrol and diesel can power vehicles. The journey will use about 70 kilos of ground coffee which, at supermarket prices of between £13 and £26 a kilo depending on brand and quality, will cost between £910 and £1,820, or between 25 and 50 times the £36 cost of petrol for the journey." How does it work? Check out the diagram below. Previously, Super Eco-Car Gets 2,752 MPG. 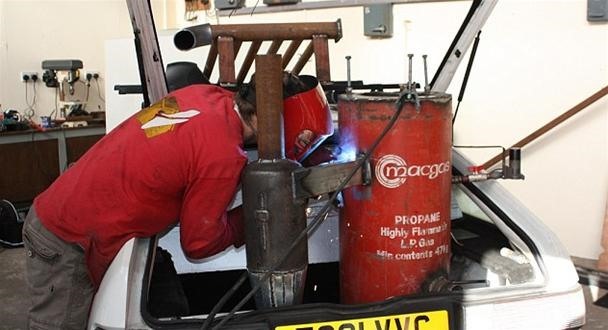 DIY "Boat Tail" Ups Fuel Economy to 64 MPG. Run Your Car With Wood Chips. Make Fuel With Mountain Dew. reading the description, it feels like if it is more charcoal than coffee fueled.